Google displays Featured Snippets in the search results for specific search queries. This article gives a useful overview of the different types of featured snippets, and how you can optimize your content to improve your chances of your website being displayed as a featured snippet. In addition to the link to the website, featured snippets also include an extended preview that is extracted from the content of the website, as well as the title and URL. The meta description is not displayed. The snippets should provide the user with a direct answer to their question – in some cases, a click on the result itself might then be unnecessary, similar to the knowledge graph. 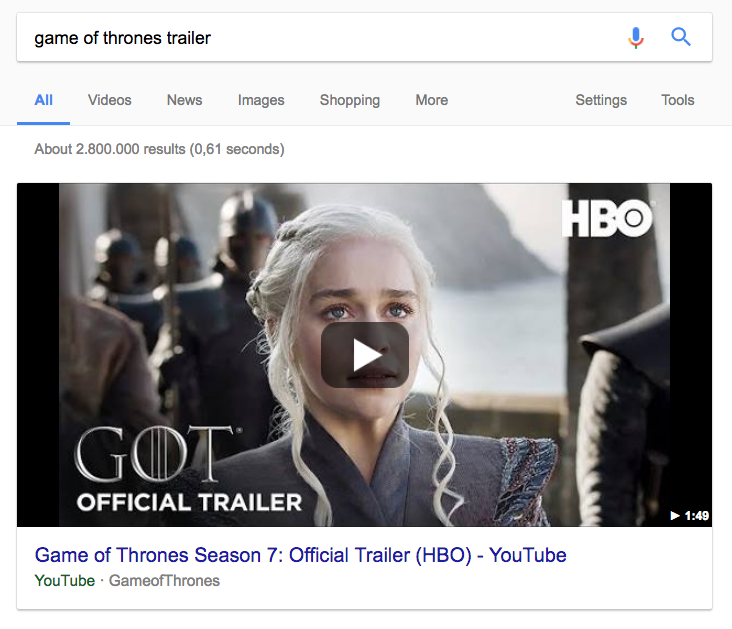 However, these representations aren’t part of the Google Knowledge Graph, but, as Google explains, a featured snippet is a “normal search result, emphasized with special layout.” Featured Snippets are programmed automatically by Google. They differ in how they are presented in the display box above the classic search results. With text snippets, one or more sentences of the website content will be extracted and displayed as a summary in a box. The title and the URL of the page can be found under the excerpt, like all Featured Snippets. Generally, a suitable image is also displayed next to the text. An example for this snippet presentation can be found for example when searching for the term “Snippets”. The image doesn’t necessarily come from the same website as the text. If the website either doesn’t contain an image, or only has (according to Google) an unsuitable image, an image from another website might appear next to the text. In Germany and Austria, text snippets usually come from websites with a high trust value, such as Wikipedia. However, they shouldn’t be confused with “Web Definitions” or other Google One Boxes, which are very similar to featured snippets in their presentation. Features Snippets with a list are often displayed in response to search queries which contain a concrete action or words, such as “instructions”. 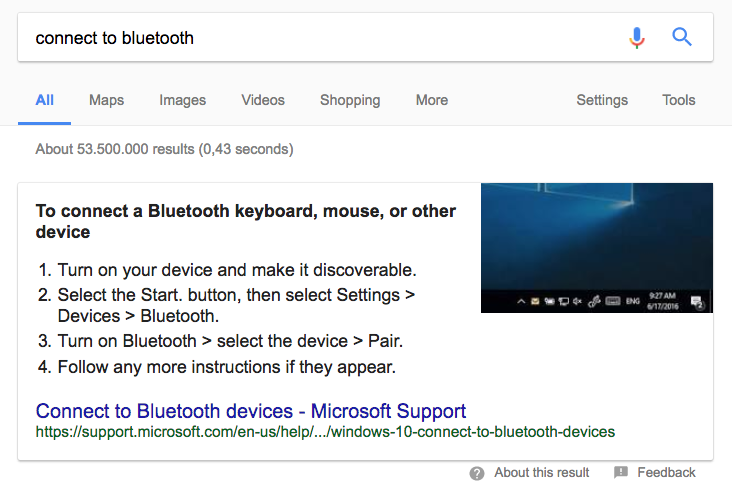 For example, this appears when searching for “connect to bluetooth” or “bluetooth intructions”. List snippets can be categorized into numerical and non-numerical lists. If, as in the above example, a step-by-step instruction is shown, this will generally be shown in a numerical list. Non-numerical lists are often provided for symptoms of illnesses for example. 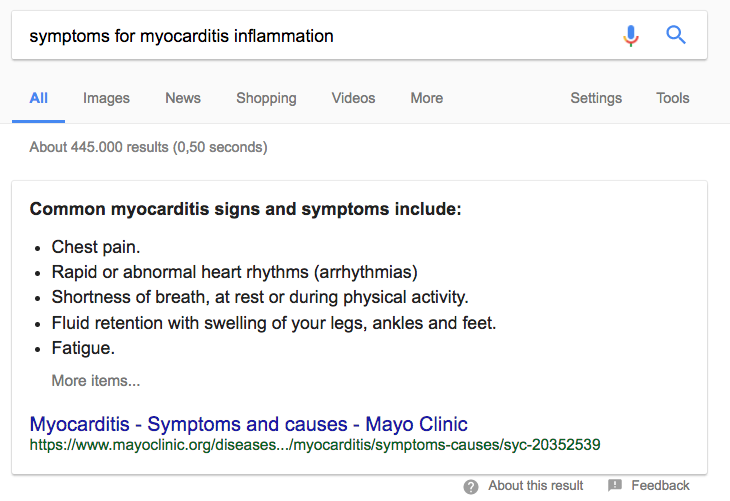 Here, possible symptoms for myocarditis are shown as an “answer-list”. Tables are often shown, when, for example, multiple options are available as an answer to the question. Certain words in search queries such as “best”, “comparison” or “list” often lead to table-answer boxes. Ahrefs carried out a survey of 2 million search queries in May 2017 and analyzed the most common English words in featured snippets. Video snippets show a big video thumbnail, including title, above the search results. This result is taken from the video search and generally, the video will be ranked first. With one click on the thumbnail, you are taken to the landing page, although generally only you tube videos are shown in this form. According to a study by gestat.com, 81.95% of answer boxes consist of text, 10,77% from lists, and 7,28% from tables. Can You Optimize Your Website for Featured Snippets? The short answer is, yes, you can optimize content to increase your chances of being displayed as a featured snippet. Since the selection of whether and which web pages are displayed in the response boxes is completely automated by Google, webmasters have no way of influencing this process, for example with meta tags. Similar to the knowledge graph, you might think that you can produce these answer boxes with Schema.org mark-ups. That however isn’t the case, as emphasized snippets and schema.org don’t correlate. For example, the above URL from myocarditisfoundation.org does not have any schema.org labels. 1. The website must be listed on the first page of search results to a search term. Only the first 10 websites that rank to a search query can be shown as a featured snippet, and it doesn’t matter whether the website is first or tenth. To find out which websites have potential to be shown as a featured snippet, you should carry out a ranking analysis of your website. Using the Google Search Console, you can find all URLs of your website which are ranked in the top 10 and therefore have potential to be displayed as a featured snippet. Once you find the URLs with the highest potential, you can optimize the content accordingly. In the case of text snippets, usually a “precise answer” to a question is used, which is provided in a paragraph on the landing page. These paragraphs should consist of two sentences, between 40 and 60 words. Long sentences are rarely used as answers. Short and clear sentences with precise statements will increase your potential to be featured as a text snippet. Featured snippets are increasingly being used for search queries that begin with a question. You should therefore use a concrete question as the heading for the paragraph that should be displayed a snippet, answering the question in the subsequent two paragraphs. To optimize for list snippets, the website doesn’t necessarily have to contain a list or such-like. It can, for example, be the case that the list displayed in the answer box consists of a list of the &lth2&gt headings from the website. HTML list elements therefore help improve chances of being shown as a featured List snippet. With table answer boxes, these tables have to be available on the website in order to be used as a featured snippet. If the available tables are too long, the rest of the characters will be blended out as “further entries” and just the first four lines will be shown visibly. 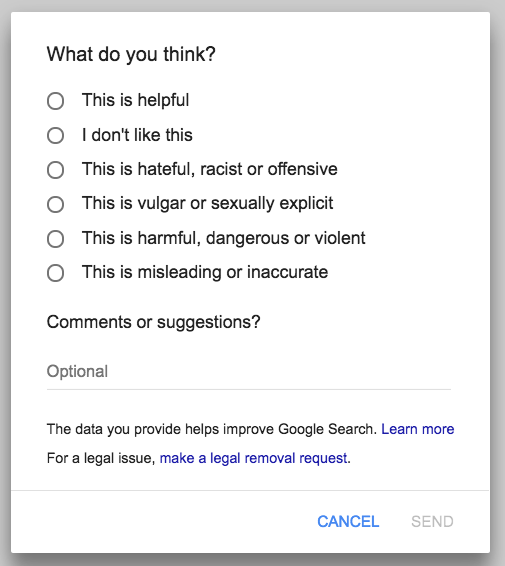 Underneath the answer boxes, google provides a “Feedback-link”. Here, using a form, you can rate whether the direct answer to the search query was helpful. Whether Featured Snippets from certain pages can be devalued by a negative rating such as clicking on “I don’t like this” is not yet clear. 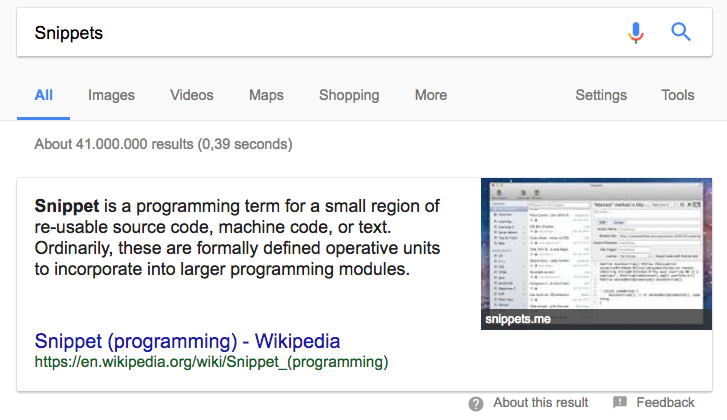 Google allows website operators to deactivate snippets if they want to avoid them for their website. For that, the following meta tag can be integrated in the website: <meta name=”googlebot” content=”nosnippet”&gt. Featured snippets in the google search results offer lots of new opportunities for search engine optimization, to increase the visibility of the website for certain search queries to a new level. The positive thing about the programmatic evaluation regarding which content is presented as a featured snippet, is that when writing texts and creating content, it is important to present the information clearly and in short sentences. Longer sentences won’t be displayed in answer boxes. Google’s goal is to provide the user direct answers with text excerpts that answer their questions exactly. Web masters should therefore prepare their texts directly in this format. Published on 11/15/2017 by Daniel Herndler.